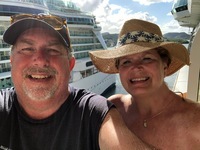 Just got back from the December 22 Southern Caribbean cruise aboard the Jewel of the Seas. The cruise was awesome with a perfect itinerary. This was our second recent cruise on RCI. Our last one was on the Serenade of the Seas which is the same class as the Jewel of the Seas. While basically the same ship, the Jewel lacked the Pub which we loved on the Serenade. Other than that the ships were identical. This cruise was over Christmas and the RCI did a great job decorating the ship for the holidays. They also had holiday themed events (singing Christmas carols in the Centrum). This trip we ended up in the specialty restaurants as we couldn’t get seating in the main dining room. That was annoying but we loved Chops and Giovanni’s. We had a terrible experience in Izumi with very poor service. The food was great though. It just took an hour to get it. I highly recommend doing room service for breakfast. It’s about $10 and is a good value for not having to rush to the buffet prior to your excursions. Also note that breakfasts seems to be very busy in the buffet. Beer selection was very lacking on the Jewel with no IPA type beer offered. While the drinks of the day were good, I like a good pale ale to drink. Cleanliness on the cruise was excellent and Dadi did a great job on helping in our cabin. We really liked a cabin on the “hump” and it’s hard to choose now between an aft cabin and a “hump” cabin. Aft gives you more privacy but I like watching docking, departures as well as the pilot boats. The pools were great and service in the pool area was superb. Solarium pool was our favorite. Overall the cruise was amazing. The issues mentioned were far outweighed by the positive experiences on our cruise. Enjoying the sun after a day in port. 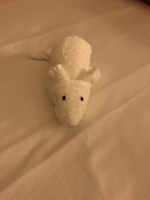 We loved the little mouse we got in our cabin. Just got back from the December 22 Southern Caribbean cruise aboard the Jewel of the Seas. The cruise was awesome with a perfect itinerary. This was our second recent cruise on RCI. Our last one was on the Serenade of the Seas which is the same class as the Jewel of the Seas. While basically the same ship, the Jewel lacked the Pub which we loved on the Serenade. Other than that the ships were identical. 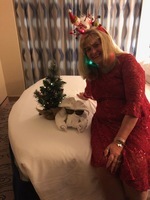 This cruise was over Christmas and the RCI did a great job decorating the ship for the holidays. They also had holiday themed events (singing Christmas carols in the Centrum). This trip we ended up in the specialty restaurants as we couldn’t get seating in the main dining room. That was annoying but we loved Chops and Giovanni’s. We had a terrible experience in Izumi with very poor service. The food was great though. It just took an hour to get it. I highly recommend doing room service for breakfast. It’s about $10 and is a good value for not having to rush to the buffet prior to your excursions. Also note that breakfasts seems to be very busy in the buffet. Beer selection was very lacking on the Jewel with no IPA type beer offered. While the drinks of the day were good, I like a good pale ale to drink. Cleanliness on the cruise was excellent and Dadi did a great job on helping in our cabin. We really liked a cabin on the “hump” and it’s hard to choose now between an aft cabin and a “hump” cabin. Aft gives you more privacy but I like watching docking, departures as well as the pilot boats. The pools were great and service in the pool area was superb. Solarium pool was our favorite. Overall the cruise was amazing. 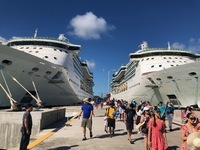 The issues mentioned were far outweighed by the positive experiences on our cruise. The cabin is your basic Royal Caribbean cabin. The storage is pretty good. Putting your bags under the bed really helps. The cabin was very clean but the glass on the shower had a huge white discoloration which looked pretty odd. Cabin service was very good. We roamed around the port on our own. It seemed pretty safe but the taxi and tour guides were quite pushy. Excellent tour and the rum is very yummy. The guide was excellent!!! The boat was very well equipped but we thought we were going to be on a sailing catamaran. We had a good time none the less and the Pitons were spectacular. This was an amazing excursion. They crew was awesome and it was very easy getting in and out of the scooter. If you are claustrophobic, you might want to consider that if you want to do this.